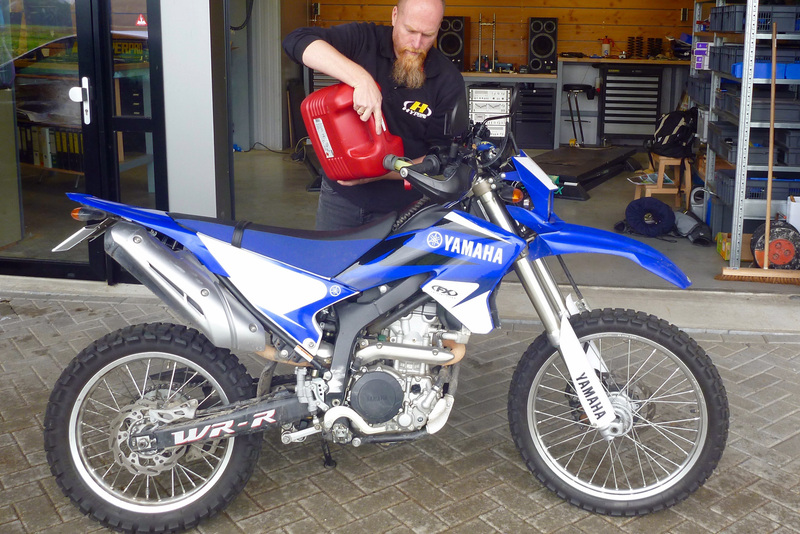 It’s taken a while and it’s not over yet but I’ve finally picked up the next AMWebsite Project Bike: a 2008 Yamaha WR250R re-sprung by Hyperpro in Holland. Cost €3900 with 5000km on the clock. Back home I have all the usuals waiting to be bolted on. More about that here. You could say the WR250R replaced the TTR250 trail but with quite a leap in spec and with a lot of influence from the WR250F full-on dirt racer, but in the UK was only sold from about 2007-09, by which time the shrunken Brit economy couldn’t hack £6000+ for a 250 Jap trail bike, even if it wasn’t your average trailie. Meanwhile, in the US, Canada and Ozzie you can still buy them new (among other places) and a gravel travel cult has grown up around the WR-R as a durable but ultra-lightweight adventurer with more power, better suspension and higher build quality than your typical CRF or KLX Jap trail donkeys (let and right) which I’ve also owned. Studies have shown that a WR is the next best thing to modern 400/450 trail bike: light, powerful, economical, well sprung. Yes we have the DRZosaurus, but they stopped importing into the UK same time as WRRs and cost the same in good nick. A CCM 450GP (left) is less proven and way out of my price range. In the UK you can also buy a new injected KLX 250S for just under £4k (lighter and better-sprung than a CRF-L), but it’s still only a regular 22-hp trail donk. 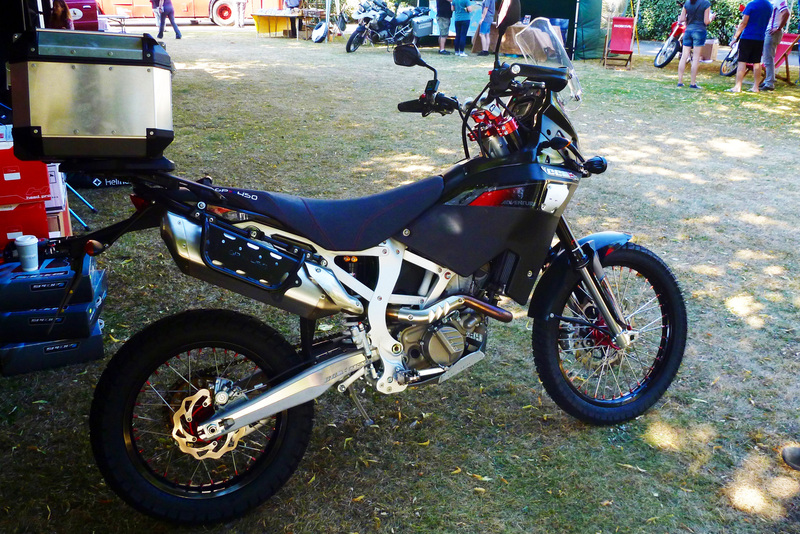 A WR-R matches a KLX on weight and suspension, and in the US has a better range of after-market kit, not least big fuel tanks. Some say it even trounces a DRZ400, but that’s probably just owner talk. Another good thing is it has a meaty 350-watt alternator which means you can easily run extra lights and clothing without sucking the battery dry. This is the flaw in a lot of older bikes, especially small capacity ones. 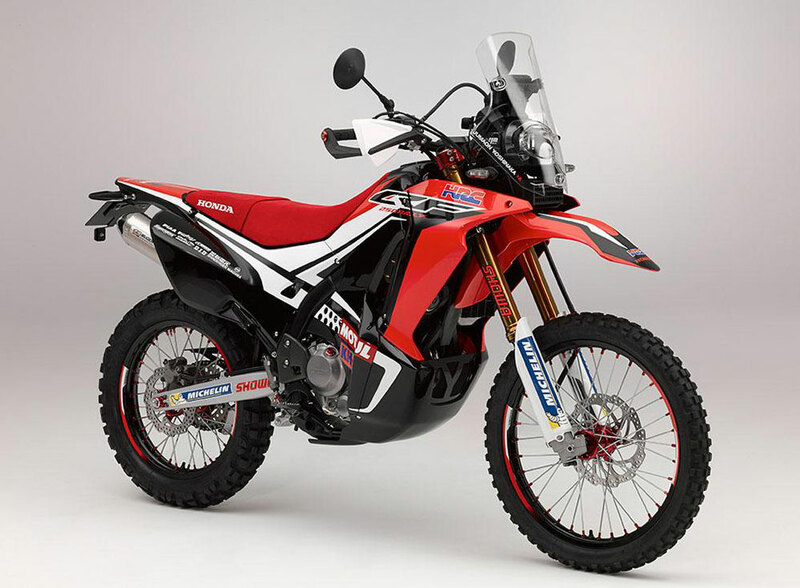 What I’m waiting for is a CRF450L or similar, but that won’t happen without a new engine, even though we hear smaller capacity adventure-styled bikes (like the Rally-version 250L, left) is now here. Right now a WR250R fits the bill for this year’s Morocco tours with hopefully a longer desert ride after. 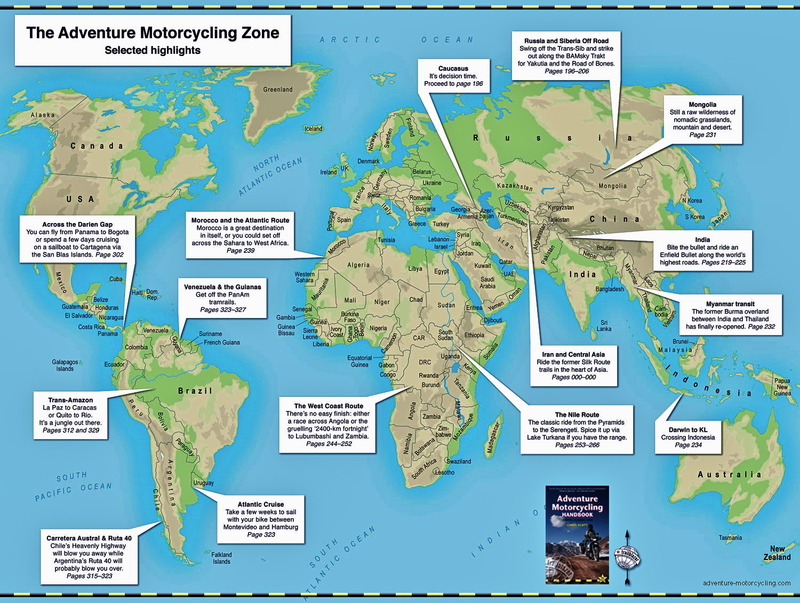 Riding down to Morocco typically gives a machine a good work out on the road and trail. Last year’s CB500X was great on the highway, but, for me, a bit heavy on rocky tracks. 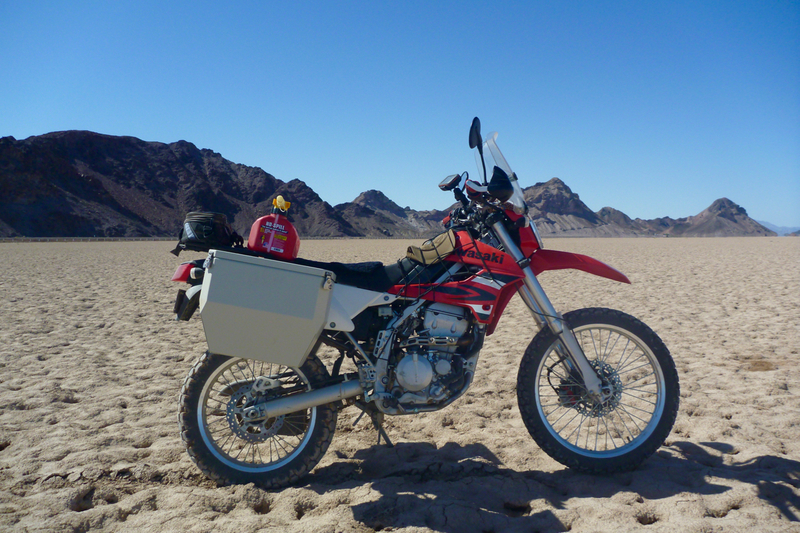 A WR is two-thirds of the weight, with I imagine commensurate performance and comfort loss on the road, but, like my old CRF-L, is able to tackle pretty much any desert riding scenario while returning economy that’s as good as a CB-X. 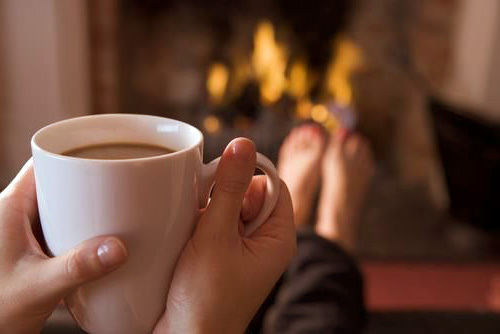 Of course I admit that pinned at 65mph into the wind on a Spanish Main with little left in reserve won’t be like sitting in front of a fire with a cup of warm cocoa, but on quieter backroads it worked fine in the US with a CRF and my current KLX. Smaller capacity bikes can be as out of their comfort zone on busy highways as a quarter-ton adv cruiser is on a sandy piste. This time round I’m prepared to take that compromise. From brand new down, there are always loads of 250Fs for sale in the UK, and you can see from the image below how easy it is to not know your Fs from your Rs, just as with Honda’s CRF-L, -X and -R. And while an WR-R is much nearer to a 250F than a Honda 250L is to an R or an X, the two Yams are not the same bike. 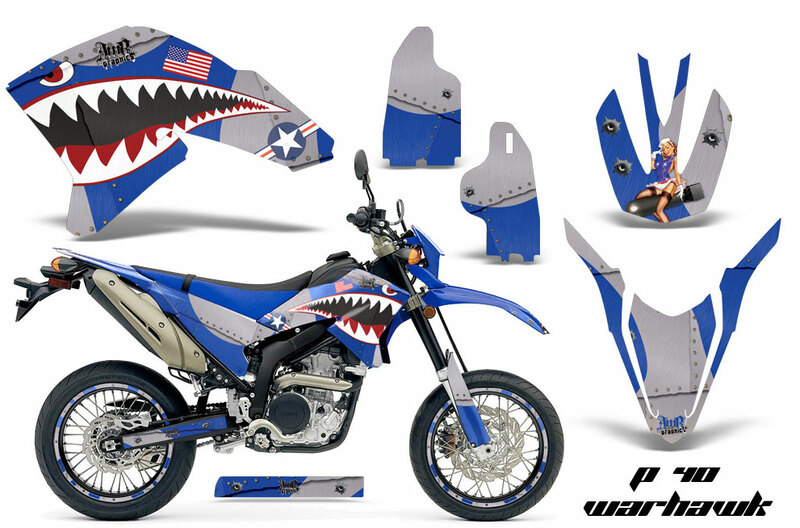 Your WR250F is a twitchy, knob-ripping, 120-kilo, 37-horse, ally framed competition chain saw with a comp ratio of a diesel and oil changes measured in hours. Meanwhile, your 28-hp R will give you 3000 miles per sumpful, 90mpg on a sunny day, but puts out some 30% more power than a regular Jap 250 trail bike. 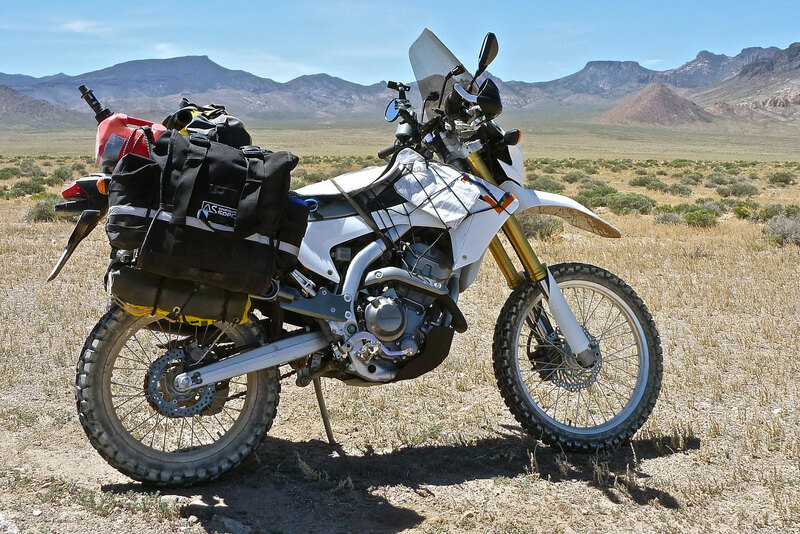 A quick spin on a dealer’s 250X proved that a WR could be a contender: a 250 trailie with a 350’s performance. This guy compares F with R.
It achieves this with various tricks taken off an R1 superbike: titanium valves, EXUP valve and a 10k rpm redline. But at the same time the efi metres out the fuel efficiently and the alternator puts out proportionally much more poke than my CB500X – great for heated clothing, Christmas lights and laser tracking. Some early models had fuel pumps which played up in hot conditions – more on the link. There was a stator recall – mine got done before being sold to me. And it’s well-known you need to keep an eye on chain wear under the swingarm – proper chain maintenance and a bigger front sprocket minimise that. (Mine got new sliders). And they say for all that money the suspension – especially the rebound damping on the rear shock – is poor (great explanatory video here). Of course these riders may be using their Rs like Fs but as it is, for desert travels the very least you’d want a higher-rated spring. Go Race and Race Tech in the US make revalve/spring kits for WR suspension. With post but no labour that’s around $1000. I got mine shod by Hyperpro – the first WR250R to get that treatment. Not really a flaw, more of a pain; the 7.6L tank is tiny but helps contribute to the excellent wet weight. Even with that list you got to admit the 250R was either ahead of its time or an unusually good effort. Actual changes since 2008 seem to amount to no more than new graphics, which some years look better than others. 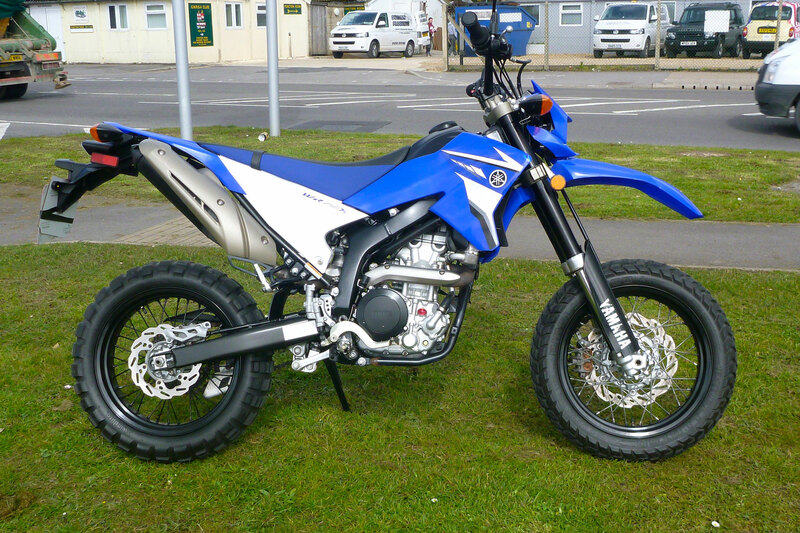 Most of the time you’ll barely find a WR250R or the 250X supermoto (left; a bit lower, fat 17s F&R, bigger front disc) for sale in the UK and I’d have been happy buying a good example of either and change an X’s front wheel. Examples I found were ’08 R with 17,500 miles for £2.5k, one from a dealer with ‘zero miles’ for £3k and a ’10 250X with 11k for the same money. Mine was effectively £3400 but with a few hundred quids worth of Hyperpro springage. That three grand would buy you a nice, two-owner, 2013 CRF-L or KLX, while most Brit WRs will have had several owners over the years. Even when an X turned up just a mile from my place for £2800, I didn’t even look at it. Meanwhile, over in France (WRs imported till 2011, afaict) there’s a bit more choice online. In Italy (imported till 2015) used prices are cheaper (new X was €6500), and WRs are still sold new in Germany for around 7000 euro. I scanned these linked websites for weeks for a decent X or R and tried to buy a few before the HP bike came up. My rationale: something like a ~2013 WR for around €4000 will be easier to sell here, even with a high Saharan mileage. Of course that had to be set against the cost of getting it and UK registration costs, but it all seemed worthwhile due to the greater selection than the few, well-used, multi-ownered, Monster-sticker clad UK examples. Stickers can be hot-aired away, but rightly or wrongly, as with so many DRZs it conjures up juvenile riding and poor maintenance practices. I can do all that myself.